By APE Collaboration (A. Bartoloni et al.). Post presented at Lattice 2001. To be published in Nucl.Phys (Proc.Suppl.) [heplat/0110153, PostScript]. By K. Jansen, N. Paschedag, D. Pleiter, H. Simma, P. Wegner. 2001. Invited talk at ICAP 2000. By APE Collaboration (F. Aglietti et al.). 2000. PROGRESS AND STATUS OF APEMILLE. By APE Collaboration (A. Bartoloni et al.). Jul 1997. 3pp. Talk at Lattice 97, Edinburgh, Scotland, 22-26 Jul 1997. PROGRAMMING LANGUAGES AND ENVIRONMENT FOR THE APEMILLE PARALLEL PROCESSOR. By E. Panizzi. Apr 1997. 7pp. Talk given at Computing in High-energy Physics (CHEP 97), Berlin, Germany, 7-11 Apr 1997. 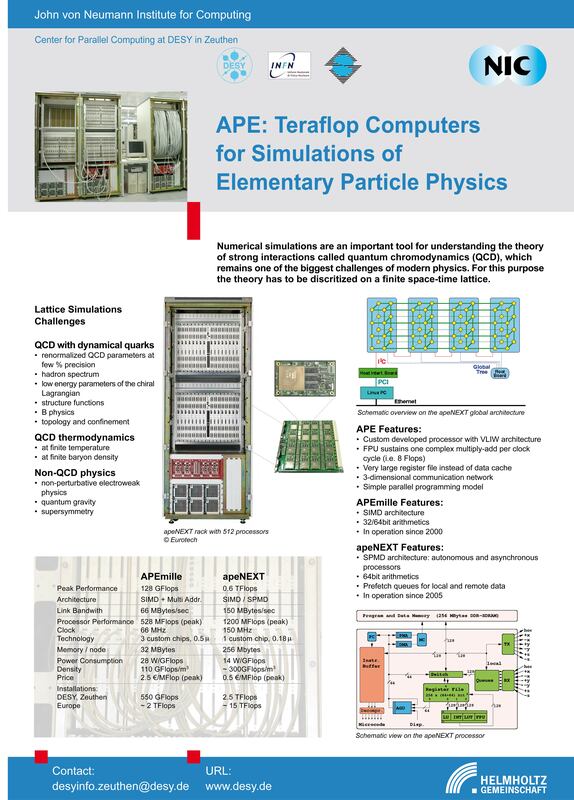 THE TERAFLOP SUPERCOMPUTER APEMILLE: ARCHITECTURE REVIEW AND PROJECT STATUS REPORT. By P. Vicini, F. Aglietti, et al. Apr 1997. 6pp. APEMILLE: A PARALLEL PROCESSOR IN THE TERAFLOP RANGE. By APE Collaboration (E. Panizzi for the collaboration). Jun 1996. 3pp. Talk at Lattice 96: St. Louis, MO, 4-8 Jun 1996.